Lilac and Friends. Courtesy of VINE Sanctuary. In nature, chickens have many close relatives, such as turkeys, partridge, quail, peacocks, and pheasants. They all belong to an ancient order of birds known as the Galliformes. The males (roosters) typically boast bright and distinct colors an important factor in attracting a mate. Because chickens are ground-nesting birds, it is advantageous for the females (hens) to have neutral coloration in order to blend in with the surrounding vegetation. Although a chicken’s wings are not capable of long distance flight, they can fly very quickly over short distances. This enables them to evade ground predators, as well as seek the refuge of tall trees to roost in at night. Their unusually strong feet allow them to forage for the subterranean insects who are an integral component of their natural diet. Few activities are more vital to a chicken’s health than dust bathing. In fact, dust bathing is often a very social event. When an ideal area is found, the chickens dig down and rub their bodies against the fine soil. The fine dust coating acts to smother parasites, such as mites, living deep within their feathers. Aside from foraging for food and dust bathing, a mother’s highest priority is building and protecting her nest. After methodically constructing a nest and carefully incubating her eggs, the mother hen watches her chicks emerge from their eggs. Over a period of several weeks, she teaches her chicks how to forage for food and avoid danger. During this time, the mother is extremely protective of her chicks, and stays in close communication with them using a myriad of calls. The chicks respond with their mightiest chirp. Chickens have an average lifespan of 7-10 years, however, they are capable of living over 15 years if conditions are optimal. Their requirements are minimal a safe place to build a nest and roost, some grass and dirt to forage through, long doses of sunshine, and a well-established pecking order. In industrial animal factories, chickens are treated as mere commodities-converting minimal inputs into cheap meat. They account for almost 90% of the nearly 10 billion land animals killed for food each year in the United States. It is hard to fully appreciate a number like 9 billion. To break it down, that means 24 million are killed every day, 17,000 each minute, or 285 every second. Each of these gentle birds is an individual with strong instincts and a desire to live as nature intended. 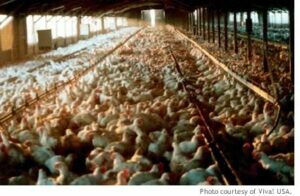 Known in the industry as ‘broilers,’ the chickens are housed in massive sheds in extreme confinement. In fact, approximately 97% of industrially farmed birds are raised in facilities that house over 100,000 individuals. They are so crowded that they are in a constant struggle to move past each other. The concrete floors are lightly covered with a thin layer of absorbent material, such as wood shavings, chopped straw or sawdust. At any given time, the chickens are standing on or walking through an ever-increasing layer of excrement. Uric acid in the waste causes burns and ulcerations to their feet and breasts. The goal of industrial farming is to manipulate an animal’s nature to make them grow as fast as possible with the least expense. In addition to extreme overcrowding, many of the sheds are artificially lit 24 hours a day to discourage the chicks from sleeping-less time sleeping means more time eating. Aggression builds as the birds are unable to establish a pecking order-a fundamental aspect of their social structure. The stress that results from this incessant activity is physically and mentally debilitating. Over the past few decades, chickens have been selectively bred to grow at three times their natural rate, resulting in far more muscle mass than their bodies can support. This commonly leads to broken bones, heart failure and respiratory disorders. Transporting chickens to the slaughterhouse is an extremely traumatic event. Before they can be loaded into the trucks, they must be physically collected. Workers disperse throughout the shed, snatching up the chickens and forcefully loading them into transport carts as fast as possible. 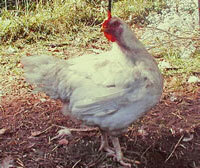 In the process, many of the chickens suffer broken wings and legs. The crates are then loaded onto large flatbed trucks. During transport, the unfamiliar sights, smells, sounds and movements cause severe stress. Current laws allow transporters to travel up to 28 consecutive hours without a rest period. The 28-hour period can be extended to 36 hours by simply submitting a written request. During this time, the chickens are deprived of food and water. Many do not survive the trip. When the chickens arrive at the slaughterhouse, the crates are unloaded and stacked onto conveyer belts. One by one, the chickens are removed from the crates and shackled by their feet. Hanging upside down, they struggle to free themselves as they are passed through an electric water bath designed to stun them before they are killed. In many industrialized animal factories, the killing lines move so quickly that many of the chickens are not properly stunned. The next station consists of automated blades that cut each chicken’s throat as they pass by, causing them to slowly bleed to death. Once again, because the killing lines move so quickly, many of the chickens do not bleed to death before reaching the next station. Their fate is the worst of all, as the next station is a scalding tank designed to remove their feathers. Poultry scientists acknowledge that when the chickens do not bleed to death, they can regain consciousness before entering the scalding tank, in which case they are boiled alive. Once the feathers have been removed, a series of eviscerating machines remove the head, feet and internal organs. 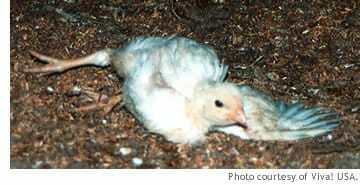 Like all other birds, chickens are not covered under the Animal Welfare Act or the federal Humane Slaughter Act. They are killed at the age of six weeks, weighing approximately 4 pounds. At this point, they are essentially still chicks. During their brief life, these birds never get to forage for food, dust bathe, or even feel dirt under their feet. They never get to enjoy the pleasures of having a mate, building a nest or raising chicks. They never experience the rain, or even feel the warmth of the sun. The most fundamental aspects of life that we take for granted are denied to these and millions of other animals. Going vegan is one of the easiest ways to help end these cruel practices and the suffering of chickens and other animals. Poultry Slaughter, 2016 Summary. United States Department of Agriculture: National Agricultural Statistics Service. February 2017. Anderson AD, McClellan J, Rossiter S, Angulo FJ. 2003. Public health consequences of use of antimicrobial agents in agriculture. In: The Resistance Phenomenon in Microbes and Infectious Disease Vectors: Implications for Human Health and Strategies for Containment: Workshop Summary (Washington, D.C.: National Academies Press, p.231-43). Accessed March 14, 2007.